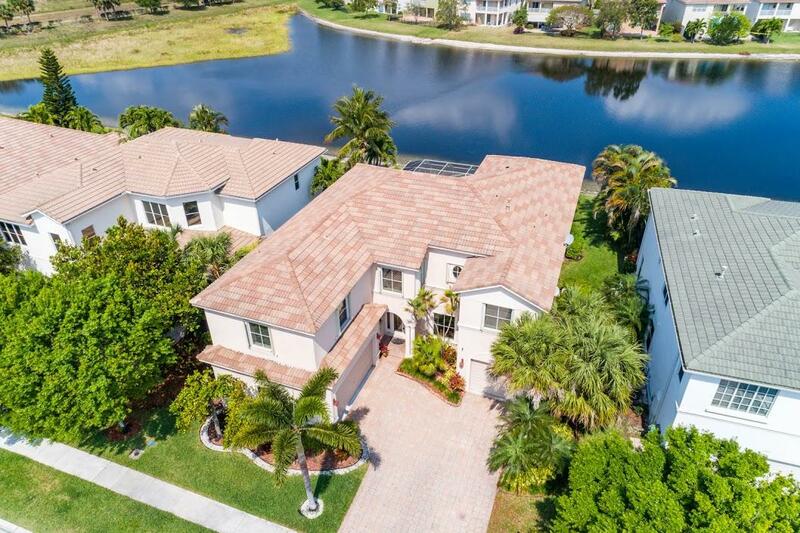 A gorgeous lakefront pool home in one of the most beautiful communities located in the Town of Wellington. Close to shopping, schools, equestrian activities, restaurants, parks, and much more. A private back yard with heated pool & Spa, enclosed screen, and water view for your relaxation. A lot of upgraded fixtures: as you step in the nice French front door, your eyes are immediately drawn to the beautiful iron staircase, and nature color tile throughout the bottom floor, customized made verticals for all bottom floor large openings. Formal living room with high ceiling, professional art painting, and wide sliding door to the beautiful backyard. Large family room connecting to breakfast area with beautiful coffered ceilings and wide sliding door to pool.